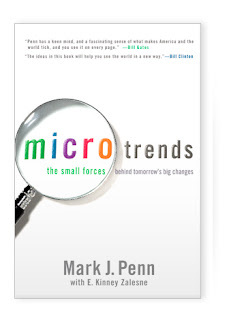 I was given Microtrends as an audiobook for easy listening. I especially enjoyed listening to it while running. It gave me something to think about while not completely distracting me. Mark Penn describes a microtrend as something a group doing something makes up at least 1% of the population and is growing. He then goes on to describe 75 microtrends he has observed based on poll data and other research. Interestingly, this book was published in 2005 and it already showing signs of being old: He predicted the Zune was going to transform the way we share music. One interesting trend Penn points out is the coming difference in age between the US and Europe. Currently, US birth rates are keeping up with death rates. However, Europeans are having far fewer children then deaths. Right now the average age in US/Europe is 25/26. However, in 15 years it will be closer to 26/50. There will literally be a generational gap in addition to an ocean. This could have huge implications. If Europeans this we're brash and stupid now, just wait. So, if you're looking for a fun read to fill you with a bunch of facts you probably won't remember, then I recommend this book. However, I would probably go with something more timeless in the future that talks about principles. Still, it's fun to review the last 10-15 years and talk about explicit trends and discuss why they're happening. In an effort to stay more up-to-date, Penn does have a website which features more current trends. That's at least worth checking out.